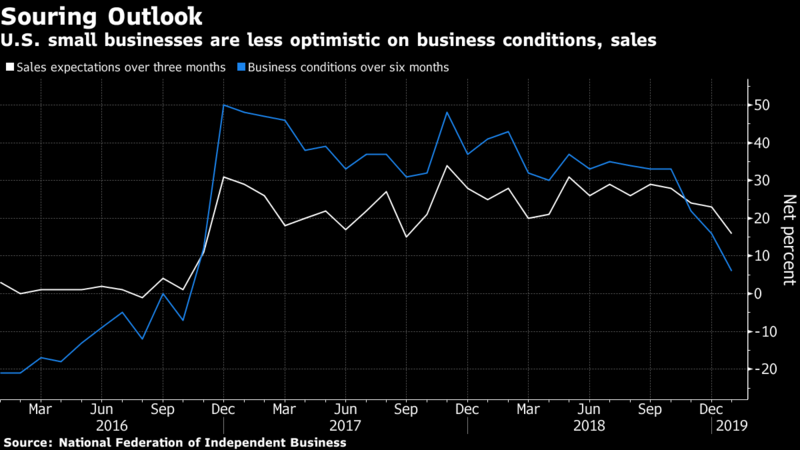 While almost all economists surveyed by Bloomberg expect growth to stay positive this year -- which would crown the current expansion the longest on record, at more than 10 years -- the risk of a recession is seen at a six-year high. In fact, more than three-quarters of corporate chief financial officers expect one by the end of 2020. Meanwhile, it’s getting harder to avoid prominent voices talking about the possibility of a contraction these days, such as Nobel laureates Paul Krugman and Robert Shiller. This may be the most closely-watched market signal of a downturn. The New York Fed has a recession-probability tracker based on the average monthly spread between yields on three-month and 10-year Treasuries. The latest reading showed the chance of a recession at 23.6 per cent for the 12 months through next January, the highest since the reading for the year through July 2008. Readings below 50 per cent aren’t necessarily safe, either: the index hasn’t topped that level since the early 1980s, even though there have since been three recessions. Billionaire investor Jeffrey Gundlach said last month that the widening gap between consumer sentiment on the current situation and expectations is the “most recessionary signal at present.” Meanwhile, a measure of small-business sentiment has lost the ground gained since President Donald Trump’s election. It’s clear that confidence measures sink during downturns, though the extent to which such surveys can actually predict a recession is debatable. The same goes for monthly surveys of manufacturers and other companies conducted by the Institute for Supply Management and five Federal Reserve banks. 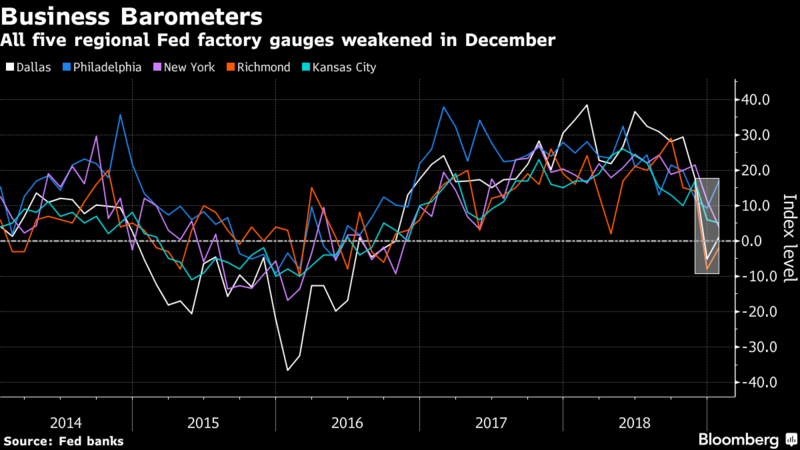 These tend to be volatile from month to month, though all the Fed factory gauges fell together in December for the first time since May 2016 and the ISM’s national index hit a two-year low (it recovered some ground in January). Further sustained weakness across the gauges would indicate the sector is slumping, though it doesn’t necessarily mean the entire economy is in trouble. 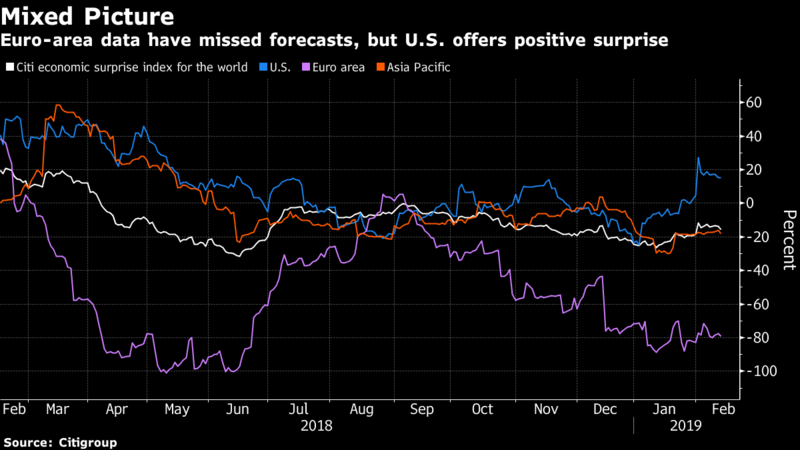 With slowing global growth pushing the Fed to pause on interest-rate hikes, Goldman Sachs Group Inc. researchers have come up with a handy way to figure how much a world slowdown affects the U.S. economy. They say that for every 1 percentage-point decline in growth outside the U.S., American expansion is reduced by about half a point. The economists currently figure a 14 per cent chance of a U.S. recession over the next year; that rises to 46 per cent with a 3 percentage-point decline in global growth, according to a report Wednesday. Ultimately, any evidence of a recession will come in principal indicators of the U.S. economy, including employment, incomes and hours worked; business sales; and of course, gross domestic product. Those are some of the figures reviewed by the National Bureau of Economic Research, the arbiter of the start and end dates of U.S. recessions. 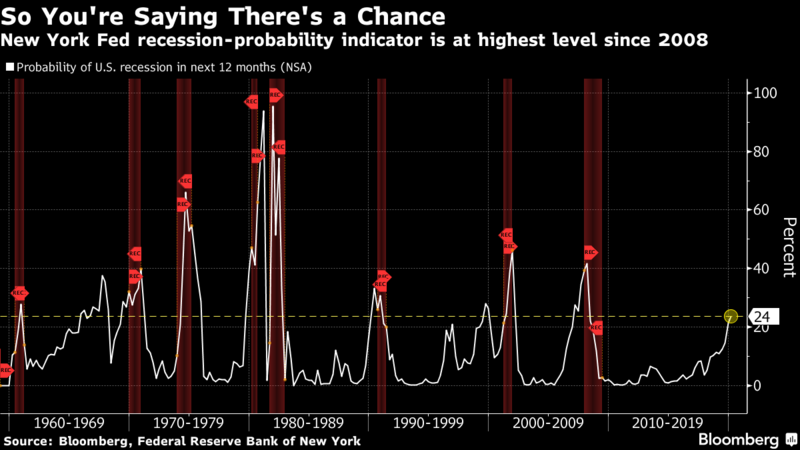 So far, those numbers aren’t close to flashing red, but when they do, it will probably be too late for any recession predictions.